Xapian::RP_DATE_PREFER_MDY - interpret ambiguous dates as month/day/year rather than day/month/year. slot_ The value slot number to query. Xapian::RP_SUFFIX - require str_ as a suffix instead of a prefix. 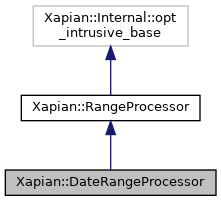 Xapian::RP_REPEATED - optionally allow str_ on both ends of the range - e.g. $1..$10 or 5m..50m. By default a prefix is only checked for on the start (e.g. date:1/1/1980..31/12/1989), and a suffix only on the end (e.g. 2..12kg). If str_ is empty, the Xapian::RP_SUFFIX and Xapian::RP_REPEATED are irrelevant, and no special strings are required at the start or end of the strings defining the range. For example, if str_ is "created:", Xapian::RP_SUFFIX is not specified, and the range processor has been added to the queryparser, the queryparser will accept "created:1/1/2000..31/12/2001". If any specified prefix is present, and the range looks like a date range, the dates are converted to the format YYYYMMDD and combined into a value range query. begin The start of the range as specified in the query string by the user. end The end of the range as specified in the query string by the user.